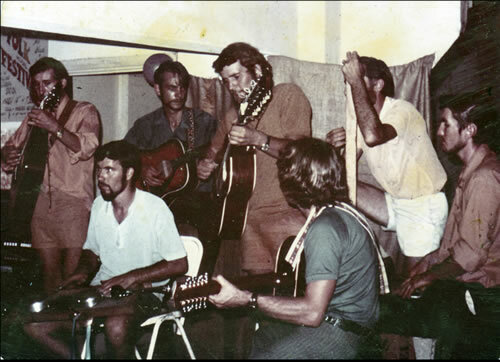 The Alice Springs Folk Club had its beginnings sometime in 1968 when a few singers gathered in The Ranch coffee lounge (owner: Bob South) to “do their own thing”. A very successful concert put on to raise money for the Save The Childrens Fund in 1969 raised $200 and the hall that was hired was packed. The concert generated great interest, and more and more people came to The Ranch on Sunday nights, so a club was formed. This became The Central Australian Folk Society (C.A.F.S.) although around town everyone knew it simply as “The Folk Club”. The aims at that stage were to save for a tape recorder and start a building fund for a clubhouse. An entrance-by-donation system was started and on many nights The Ranch was packed. Many well known artists of folk and country and western came to The Ranch including Slim Dusty, Ray Rivermont, Margret Roadknight and Merle Lamb. Unfortunately The Ranch closed down and, after months of unsuccessfully searching for a venue, the club ended up at The Elkira Motel. Throughout the years the club used just about every pub in town as well as the CWA Hall, The Totem Theatre, and even a local restaurant. In 1971 The Managing Director of Connair, Eddie Connelan, offered the club the use of his airline’s old caretaker’s cottage behind the town cemetery. Over the years the club members turned the cottage into a very effective club house where tapes and books were kept and functions could be held. Early members of the club included Taffy and Jan Evans, Peter Bate, Dave Spafford, and Dave Tuzewski, just to name a few. The clubs record of “public service” in the early days was very impressive with members singing at schools, the hospital, the Old Timers Home, School Of The Air, as well as organising concerts. It took a while to wean the town away from their Slim Dusty records, however at its height of popularity in the 70’s and 80’s the club boasted a membership of over 150 and the Sunday folk club nights often attracted upwards of 200 people. Locals were treated to a variety of musical styles from Traditional through to Contemporary, with Australian and Overseas songs as well as a healthy smattering of bush poetry. Visiting artists from both Australia and overseas featured on many a Sunday night, along with local performers. Such was the quality of some of the local performers that over the years various groups were formed, the most notable being “The Hawkers”, “Bloodwood” and “Facial Expressions”. Notable solo artists included Barry Skipsey, Ken Ferguson (sadly now deceased) and Bob Sharp. With the exception of The Hawkers, all these performers went on to record and sell their own records. The nineties saw a general decline in attendance at the weekly folk sessions, as was the case around much of Australia, and with venues becoming harder to find it was perhaps inevitable that eventually the weekly sessions would stop. However that’s not the whole story!! About 3,000 people attended a concert at the Telegraph Station in March 1971 held to celebrate the Centenary of Alice Springs. The following year a few Alice folkies attended a concert in Darwin, and so I suppose you could say that the Annual Top Half Festivals had started. Folk clubs from the Top Half of Australia had formed a Federation sometime around 1972, and it was decided to hold a festival every June Queens Birthday weekend. This alternated primarily between Mt. Isa, Darwin and Alice Springs although in later years Mt. Isa dropped out. This Festival has now run for over 40 years and is one of the longest running annual folk festivals in Australia. The popularity of The Alice Springs Folk Club in the 70’s along with the successful Top Half Festivals led to the club hosting two National Folk Festivals – in 1980 and 1987. The 1980 Festival was the first time “The National” had been held outside a capital city. Both festivals were considered a huge success. The weekly folk sessions may have finished in Alice in the 1990’s, but many of the performers are still seen around town performing at either paid gigs or at charity shows, and of course there is the annual “Top Half” which is held every second year in The Centre. Some of the early performers/club members are still living in Alice Springs today (2012) and The Top Half Folk Festival is still being held in Alice Springs every second year. Although there is no regular income to fund this festival, money has been raised in the last few years, thanks to a few intrepid folkies, by holding a very successful concert in the Old Alice Springs Gaol, and by organising a St. Andrews Night Dinner each November. At the 39th Top Half Folk Festival in Alice Springs, in June 2009, a group of CAFS members got together to discuss the CAFS cassette tape collection. The collection comprises over 35 years of recordings of folk club concerts, from regular Sunday night sessions to festivals and special occasions. It was decided that an attempt should be made to restore the collection. Although ongoing, the intention is to digitise each cassette and, where necessary, edit and clean the recording to produce a CD and digital music files. Copies of the digital music files will be provided to the National Library of Australia and other archival institutions. Who knows? Live music in Alice Springs, performed by locals, is at the mercy of the local pubs and restaurants and opportunities change from day to day. Folk Music? It is hoped the festivals will continue for many years to come, but they are in the hands of a dedicated few, and unless there is an influx of younger impassioned folk style enthusiasts the “Top Halfs” will one day become part of folk history.